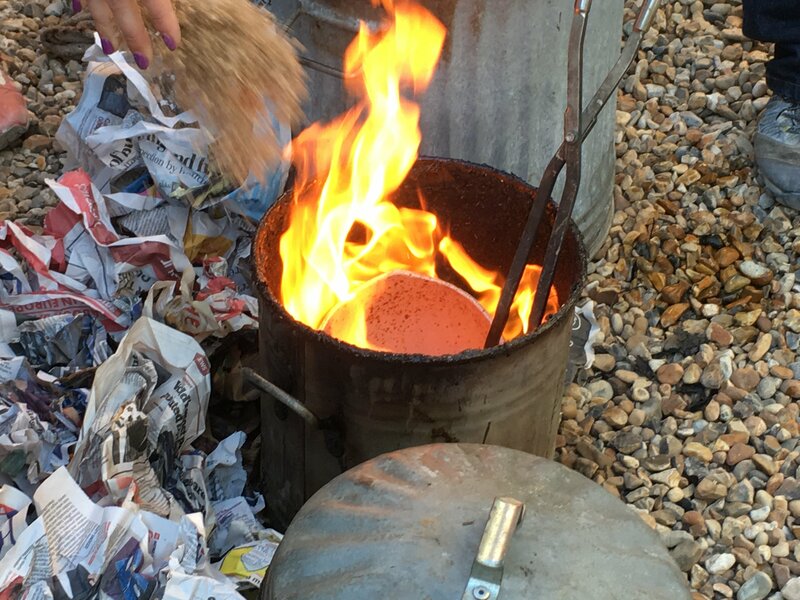 This workshop is suitable for everyone, whether you are new to Raku and want to learn a bit about this exciting firing technique, or you are an old hand at it. The Raku day is suitable for everyone, whether you are new to Raku and want to learn a bit about this exciting firing technique, or you are an old hand at it. Firing day – Sunday 12th May* 10 am – 7pm (weather permitting – backup date to be Saturday 1st June) . Booking – online through the website. The Raku day will include an overview of the Raku process and regular firings throughout the day. You may bring your own bisque fired pots (please see below for size and construction details) or we will have some bisque pots available to buy on the day for you to decorate, glaze and fire. We are planning to have a shared lunch. If you are happy to participate in this please bring something to share. Tea, coffee and biscuits will be provided. Raku is an exciting process involving flames, very hot pots and smoke. Please wear cotton clothing with long sleeves (You will smell smokey at the end of the day!). Please do not wear open toed shoes. Please ensure that hair is tied back if long and clothing isn’t flowing. We will control some of the smoke by using wet towels over the reduction bins, but there will likely still be a considerable amount of smoke generated throughout the day (face masks available). If you have any thick gloves (gardening/ leather/ welding etc) please bring them. They can be useful for handling your hot pots when they come out of the reduction bin. If you wish to bring/make your own pots please make sure they fit within these guidelines. Pots need to made from a raku clay (such as Ashraf Hanna clay) or a crank body and of an even thickness and not too thin walled to survive the thermal shock. Pots need to be bisque fired. We are limited by the size of the kiln so pieces need to be no more than 18cm wide or 23cm tall. Please only bring one piece at the top end of these of these measurements. We will make sure that everyone gets the chance to fire at least three pieces throughout the day. You are welcome to bring a few more but there may not be time or space to fire them. *Dates – Please make sure you are free for both the firing day and the backup day. We can not refund you if the first day is postponed due to the weather and you can not make the backup day. If both days are cancelled due to the weather we will offer you a refund or you can carry the booking forward to an alternative date in the future. By placing a booking via submitting a Booking Form we will assume that you have read, understood and accepted these Terms and Conditions. All references to the Terms and Conditions refer to these Terms and Conditions as amended and updated from time to time. Pottery Gagliano’s postal address is 16-30 Hollingdean Road, Brighton,BN2 4AA 07789 997361 or by email to contact@potterygagliano.co.uk. I am registered with the Information Commissioner’s Office (ICO) for data protection (reference number to follow soon). “Pottery Gagliano” means the entity with which you have entered into this Agreement. “Booking Form” means the form relating to the booking of the courses, events, workshops or open studio which incorporates these Terms and Conditions. “Fee” means the amount payable for the courses, events, workshops or open studio – in person or online as detailed in the Booking Form. “Event, Workshop or Training” means any specific courses, events, workshops or open studio which Pottery Gagliano offers. “Open Studio” means the pottery studio which Pottery Gagliano offers. “Term ” denotes the periods throughout the year(s) during which we run courses, event or workshop. “Venue” means the place at which Pottery Gagliano provides the courses, event or workshop. Courses, events, workshops or open studio time must be booked using the Booking Form online or in person and the Fee must be paid in advance of the event unless otherwise agreed and can be proven by document, online or written. Payment of the Fee shall be due to Pottery Gagliano within the date specified on the event information page. If payment is not received within the specified time the Booking Form is submitted, a place is not confirmed or guaranteed. If we are unable to accept your booking and the Fee has been paid, we will inform you of this in writing, or email and refund you the Fee paid. The price doesn’t include materials and firing costs. The artwork will be charged at £6 per kg, payable to the tutor. The persons place may in exceptional cases be offered to an acquaintance provided adequate notice is given and the friend or acquaintance completes a Booking Form and expressly agrees to these Terms and Conditions; and we agree they are suitable for the course/event. Subject to availability, adequate notice and without any guarantee, Pottery Gagliano may be able to fit the person into another course, event or wokshop that week. Pottery Gagliano may cancel this Agreement at any time and for any reason whatsoever. If the Agreement is cancelled by Pottery Gagliano, the unused portion of the Fee will be refunded to the customer. If for any reason a specified teacher is unable to run an event, then Pottery Gagliano will do its best to provide another Pottery Gagliano teacher. If this is not possible, Pottery Gagliano will, at its sole option, either (i) reschedule the teaching by adding another teaching or (ii) will refund the Fee for that Class. The customer acknowledges and agrees that Pottery Gagliano reserves the right to replace any teacher of an event without notice to the customer at any time prior to that event without any liability arising from such a change except in accordance with these Terms. comply with all applicable statutory and regulatory requirements for supplying the teaching in the United Kingdom, or elsewhere. These Terms apply to any replacement training Pottery Gagliano supply to the customer in the unlikely event that the original classes, courses, events or workshops do not conform with these Terms. Teaching will start on time and people must arrive before the event is due to start. The Pottery Gagliano environment is relaxed and sociable, however to show respect for the group, general chatter must be kept to a minimum to ensure that the teacher can be heard and that the focus is kept on learning. It is the participants responsibility to wear suitable clothing and we cannot be held liable for any participant’s by lack of care or awareness of the particpant. If the teacher determines that the participant is disruptive, the teacher on behalf of Pottery Gagliano, shall be entitled to exclude the participant. when attending the premises the participant will not be knowingly suffering from any illness, infectious disease or anything similar thereto. Pottery Gagliano shall not be responsible for any loss that a participant suffers as a result, except for those losses which it could reasonably foresee would result from the failure to comply with these Terms and Conditions. any other matter for which it would be illegal or unlawful for Pottery Gagliano to exclude or attempt to exclude its liability. The participant agrees that any claim against Pottery Gagliano or any teacher, practitioner, employee or agent of Pottery Gagliano must be brought within 60 days of the event that gave rise to such claim. The participant agrees any claim made thereafter should be discussed. The participant acknowledges, warrants and undertakes that the maximum aggregate liability of Pottery Gagliano to the participant under these Terms and Conditions shall not exceed the Fee paid. All warranties and conditions whether implied by statute or otherwise are so far as is permitted excluded from these Terms and Conditions. Pottery Gagliano acts a Data Controller in relation to services supplied under these Terms and Conditions and the person responsible for data protection matters is Roberto Gagliano. Pottery Gagliano shall ensure that data processing only takes place in accordance with the terms of this Terms and Conditions and any Data Processing Agreements in place from time to time. Pottery Gagliano only processes personal data where it has a lawful basis to do so. Pottery Gagliano may store and process personal data via our servers located in the EU, or any other country that provides suitable and adequate security measures to protect the data. Data will be transferred in accordance with the relevant data protection laws. Please visit https://www.potterygagliano.co.uk/privacy-policy/ for further information on how we handle, store and use your data. Once our relationship with you as a user of our Pottery Studio has terminated, we will retain personal information only to comply with legal requirements, prevent fraud, collect any fees owed, resolve disputes, troubleshoot problems, assist with any investigations, enforce our Terms and Conditions, and take any action permitted by law. Pottery Gagliano reserves the right to all intellectual property in relation to this website and the services provided. Use of the services does not give the user any ownership in the services, its content or any trademark or logo used on the website. Pottery Gagliano will not be liable or responsible for any failure to perform, or delay in performance of, any of its obligations under the Agreement that is caused by events outside its reasonable control. Such causes include, but are not limited to: power failure, internet service provider failure, industrial action, civil unrest, fire, flood, storms, earthquakes, acts of terrorism, acts of war, governmental action or any other event that is beyond the control of Pottery Gagliano.